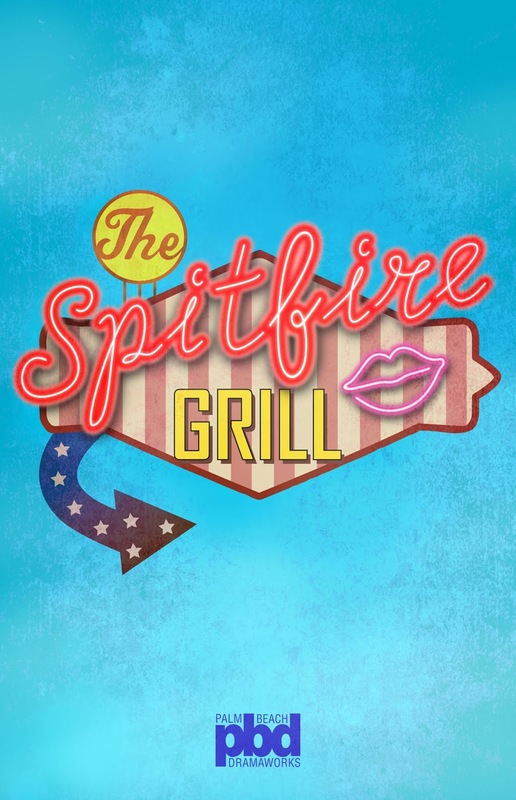 An exuberant production by topnotch professionals convincingly delivers The Spitfire Grill’s message of the redemptive power of forgiveness and second chances. 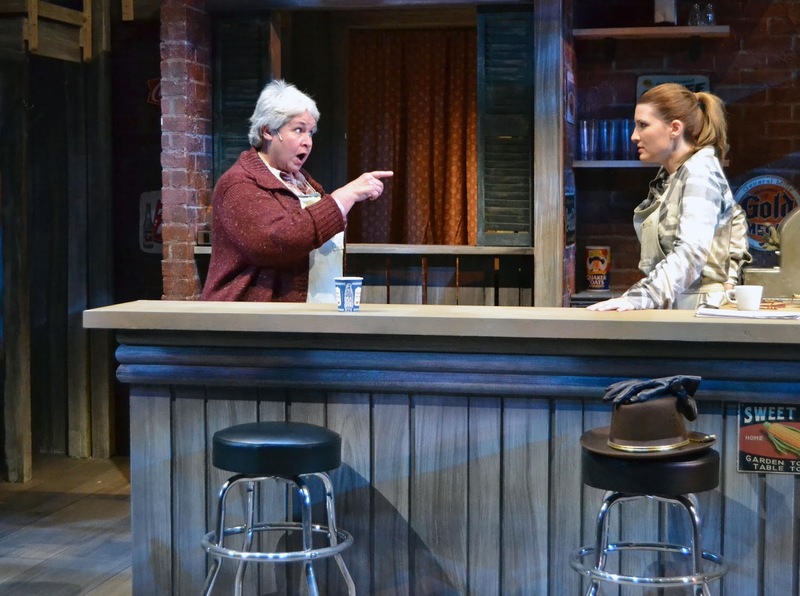 This compelling effort by Palm Beach Dramaworks’ cast enhances the play’s many transformational high points, as satisfying as meat loaf with mashed potatoes and a helping of hot apple pie for dessert. American literature and theatre has always been susceptible to the wholesome yet troubled heartbeat of small town life, Thornton Wilder's Our Town, Meredith Willson’s The Music Man, William Inge’s Picnic, Sherwood Anderson’s Winesburg, Ohio, and in film Frank Capra’s It’s a Wonderful Life. Add this production of The Spitfire Grill to the list, distinctive and deeply moving in its own way. The music and lyrics by James Valcq with lyrics and book by Fred Alley is based upon the 1996 film by Lee David Zlotoff, but with an unabashedly (and in these times desperately needed) upbeat ending. While in prison our young protagonist, Percy Talbott, prepares for her life as a parolee by randomly cutting out a photograph of the fictional town of Gilead, Wisconsin in resplendent fall colors from a travel magazine. She chooses this as her serendipitous destination upon release. But she finds it a depressed community; people on guard about her, including the local Sheriff, Joe Sutter, who declares she’s come to a place to leave (projecting his own feelings). 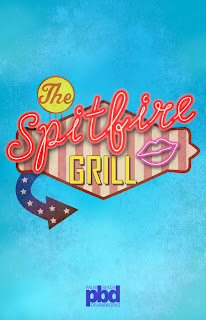 There is no real employment other than at the centerpiece of the town, the now failing Spitfire Grill, a diner owned by cantankerous Hannah Ferguson who has been trying to sell it for years. The townspeople come and go through this diner, ultimately revealing their own figurative prisons. Hannah’s nephew, Caleb Thorpe, is still bitter that the stone quarry closed, losing his job as foreman. He’s lost his self respect, dominating his timid wife Shelby who ultimately comes to help out at the diner. The postmistress, Effy Krayneck (names don’t get much more vivid than that) carries the town gossip and supplies some much needed comic relief. There is also the mysterious stranger who never utters a word but stalks the action. This incendiary mixture ignites a cathartic yet palliative plot for revealing secrets and allowing the town to see itself in a new light. The awakening begins with an idea Percy suggests – aided by her persuasively written contest copy -- to give the outside world an opportunity to enter an essay contest with a $100 fee “Why I want the Spitfire Grill.” Those essays arrive in increasing numbers, and with heartrending content. This dramatic musical is delivered with soul searching intensity by an outstanding cast and musical accompaniment. It is not a big Broadway production but is reminiscent of Sondheim’s work where language and song seem to merge, and the inner thoughts and feelings of the characters are transported by the lyrics. Each performer in the PBD’s production is ideally suited to his or her part, making one wonder whether they are exceptionally talented actors who can also sing, or professional singers who can also act. 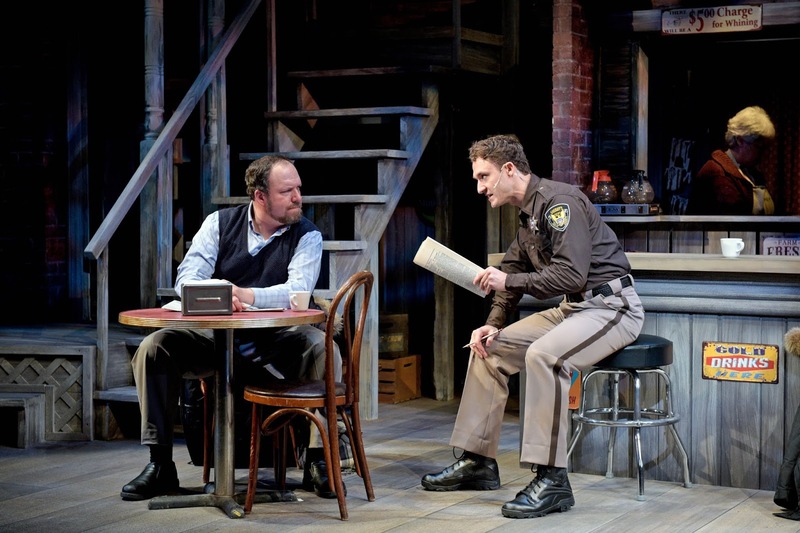 Ashely Rose, her PBD debut, plays Percy, the parolee with a dark secret, a shocking past. Rose carries her character’s deeply seated hurt and trust issues with a defensive jadedness; slowly opening up to the community as friends are made and ultimately secrets are shared. She once played the lead in Always…Patsy Cline and here she delivers her songs with that country sensibility, always reaching those notes of loneliness and powerful emotional truths that country music so often evokes. 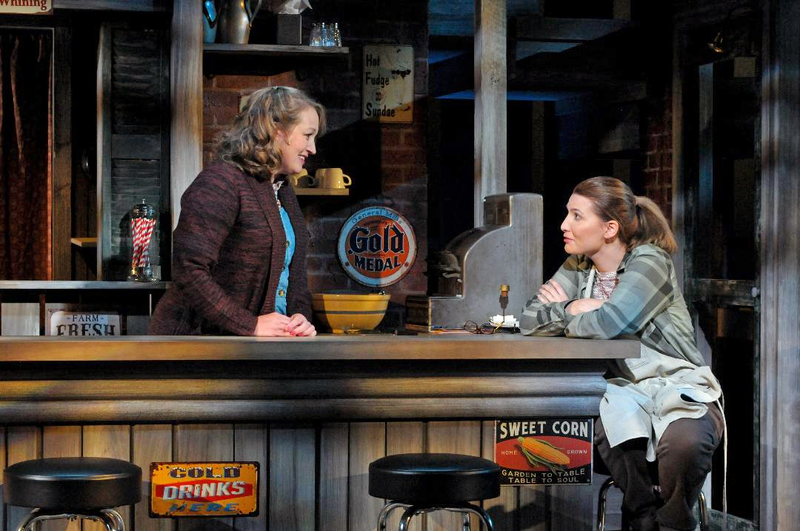 Rose’s comedic talents are on full display in her number “Out of the Frying Pan” as she sings this country song while wrestling with the demands of cooking, frantically juggling pots and pans, reminiscent of a Lucille Ball. Her show-stopping song near the end, “Shine,” is both musically heartrending and dramatically affecting. It is at this moment that she finds the light, the “shine” in herself and can cast off her past. Amy Miller Brennan’s performance as the initially introverted, browbeaten Shelby, is metamorphic as she blossoms into an independent woman right before our eyes. She and Percy bond at the Grill and it is there she sings her beautiful ballad to Percy “When Hope Goes” revealing the day the town’s childhood hero went to war, Hannah’s son, Eli, much admired by the town, never to return and changing the town forever. Brennan has an exceptional musical theatre voice, so ideally suited for pairing to Rose’s as is evident in their duet, “The Colors of Paradise.” Also a PBD newcomer, her passage from Caleb’s often abused wife is heartening to witness, culminating with her song, “Wild Bird” consoling Percy in her arms. This is also a play about three wildly different women miraculously bonding and the bedrock of that triumvirate is one of the grand dames of the South Florida theatre scene, the veteran of so many productions, including several at PBD, Elizabeth Dimon. She’s the prickly, hardened Hannah, the owner of the Spitfire, who through her interaction with Percy and Shelby finds a family and redemption. She, like Percy, has carried a sad secret and is ultimately able to cathartically expunge it. 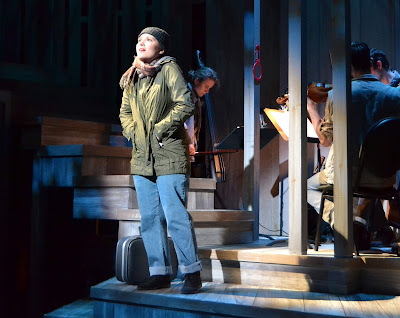 Her beautiful musical rendition of the dirge like ballad, “Way Back Home” displays her talents both as a singer and an actor. Johnbarry Green makes his PBD debut a poignant success through playing the part of Caleb Thorpe, the nominal villain as he dominates his intimidated wife, Shelby. But at heart, and Green brings this out with such conviction, he is a man who has been emasculated by the loss of work, and changes brought on by the passing of time over which he has had no control, the audience feeling his pain while he sings “Digging Stone.” Green showcases his character’s loss of self respect with a heavy, mystified force. Ultimately he too finds release from the prison of his own making with his clear baritone voice adding conviction to his acting and depth to his songs. 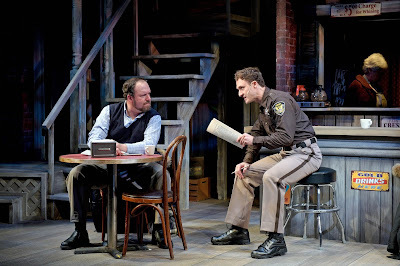 David A. Hyland is the “The Visitor.” Hyland is a PBD veteran and it is strange to see him in a non-speaking role, but his hulking pained figure on stage speaks volumes about the past and regret, and tears easily well up in his eyes about his life. Suffice it to say, the audience quickly surmises who the “Visitor” is and how he relates to the core of the story. Director Bruce Linser has many musical credits on his resume, including last season’s smash hit, Woody Guthrie’s American Song. He knows how to manage a complicated musical, and, in spite of its outward simplicity, there are so many moving parts to this show, different scenes, and times of the day, seasons, and the evolution from depression to outright joy, all of this in a relatively small space. Scenes are changing on one side of the stage as another is underway on the other side. Linser brings out the best from his talented cast and musicians, not allowing the characters to become stereotypes. Each has his or her own story, becoming fully integrated as the plot evolves. The incredibly talented Lubben Brothers, triplets Josh, Tom and Michael (who were such a hit in Woody Guthrie’s American Song) now perform under the show’s musical director, Joshua Lubben, along with his talented wife, Katie. They form the orchestra for this show and resoundingly back the company with mostly piano, guitar, accordion, violin, or bass, the latter instrument underscoring the mournful moments. Some of the music has almost a liturgical feeling, although deeply rooted in folk and country, with many elements of Celtic music. Phrases are frequently repeated in a song, driving home meaning and emotion. Even when the cast is not singing there are often musical riffs played in the background. 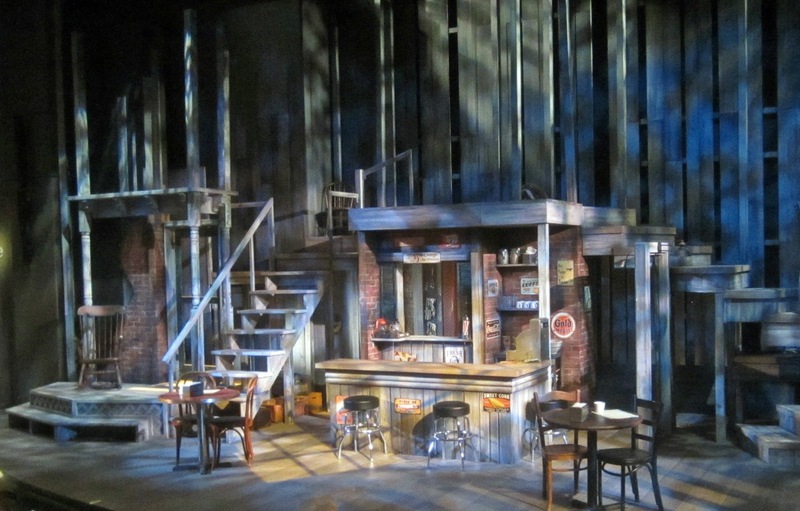 Paul Black had the unusual task of being both the scenic and lighting designer. Accordingly, he could conceive one knowing what he would do with the other so there is a harmonic effect. This is a complicated play to design, the same challenges that Linser had to deal with in the performance space, he addresses in the physical space. 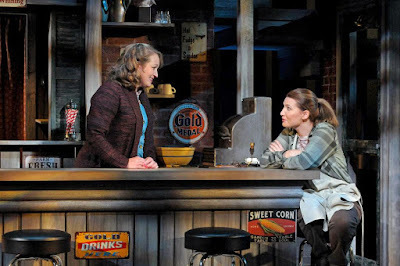 At first I thought the scenic design too intricate until the performance was underway, each scene flowing into the next, actors passing from the figurative outside, into the diner, through the back door and to the outside once again. There are stairways to a second level which serve different scenes, including the opening one of Percy leaving prison and her concluding one, reaching the top of her emotional mountain. 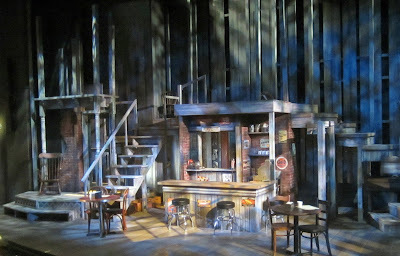 Lighting had to denote seasons, times, moods, and highlight one side of the stage while another was preparing for the next scene. Costume design by Brian O’Keefe was similarly challenged given the cinematic, scene to scene, month to month, changes over a full year. There are pallets of colors associated with each character, with costume changes to indicate the passage of time. These are realistic costumes to identify everyday people in rural Wisconsin. Think plaid, jeans, and mukluks. Brad Pawlak sound design captures all this great music, and sounds from the woods – birds, geese flying overhead, and I thought I heard a few Wisconsin crickets. In spite of a very busy sound design, the sound and the musical accompaniment never overwhelmed the lyrics. Stage Manager James Danford, the veteran of untold productions, keeps everyone on cue and all props in their proper place, a feat in a complicated production such as this. Stage managers are the unsung heroes of such productions, becoming, in effect, the director from opening night. Indeed, “Something’s Cooking at the Spitfire Grill.” Palm Beach Dramaworks serves up this heartwarming musical story with skill and enthusiasm.